If you are looking for an easy care plant that can be used for culinary purposes then Murraya koenigii or “Curry Leaf” is probably not one to consider. Before you rush out and plant one consider the environment, they self seed and can become a problem. This means you will need to pull out self sown seedlings as well as try to remove all of the flower heads, lots of work. Murraya koenigii or “Curry Leaf” is a popular ingredient in Indian cooking and is one of the easier herbs to grow. So if you are a keen chef, yes you can easily ‘grow your own’. A little warning here, we suggest growing in a pot or container as it is a plant that suckers easily, in some areas, especially warmer tropical to sub tropical climates it is a plant that can become a weed. Even in cooler temperate climates it can ‘get away’. 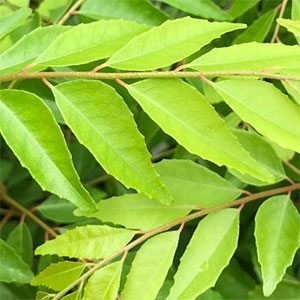 Curry Leaf is a small evergreen tree, or bush that requires very little in terms of special conditions or care, in fact they grow so easily they can become weedy so you need to be careful. If you are a regular user you will trim it regularly and chances are it will not get the chance to seed, if not remember that its seeds spread easily……..
We suggest that you prune Murraya koenigii regularly, we also suggest that you prune the flower heads away before they set seed. This is an easy plant too propagate, you can choose cuttings, root cuttings or try growing it from seed. Remember that the seeds are poisonous, sow them fresh just on top of a normal potting mix with a light covering of soil. Keep them moist and in a warn position and the seeds will germinate readily. Position – Full sun is best. Flowers – Sprays of fragrant white flowers mainly in spring, however spot flowering through the year. Fertiliser – Use a good organic fertiliser in spring. Readily Available from nurseries and herb suppliers.